1. Nobody Listens to The Radio Anymore. Media expert Doug Schoen wrote in Forbes, "You wouldn’t know it from all the media coverage focused on streaming video and streaming music, but recent Nielsen data shows radio actually has the most reach among American media consumers. 93% of adults listen to the radio each week as compared to 87% who watch TV, a substantive difference." 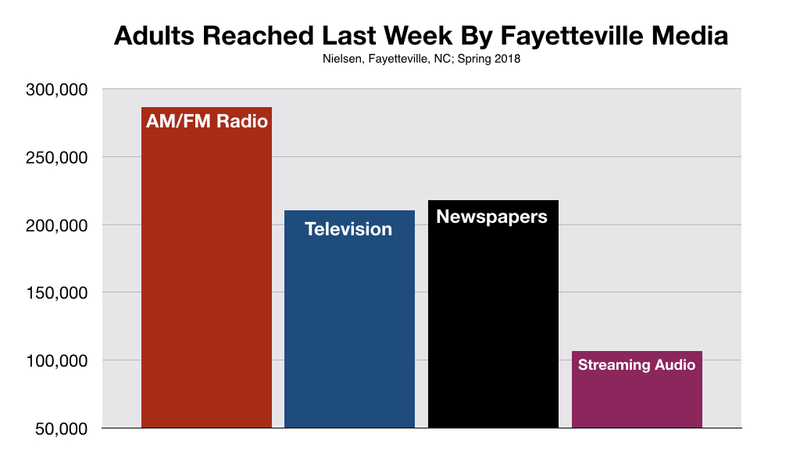 Last week in Fayetteville, for instance, 288,946 adult consumers tuned-in to their favorite radio stations. This is significantly more than the 181,951 consumers reached by area TV stations or the 182,061 reached by local newspapers. Radio's massive reach among consumers led Deloitte, the world's largest business consulting firm, to recommend that "radio should be a big part of the mix for those buying advertising." Jim Grafstrom manages the Crown Complex. He has been advertising continually on Fayetteville radio since he assumed the role in 2013. 2. Millennials Don't Listen To The Radio. 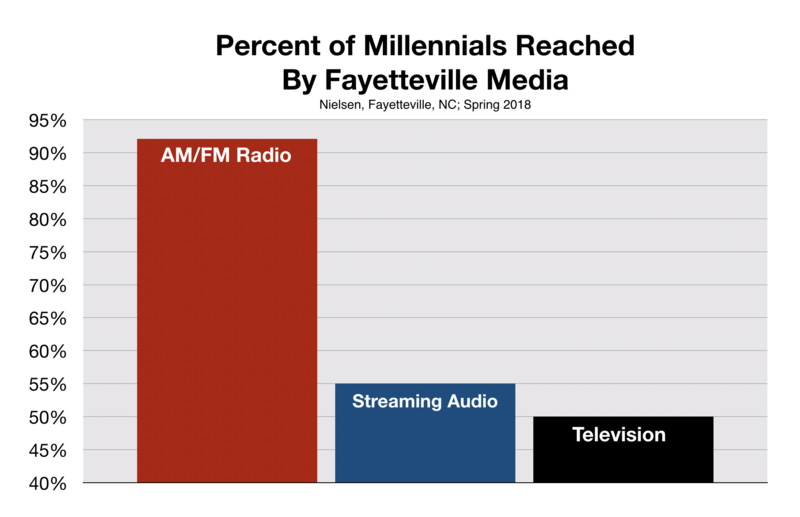 Despite a proclivity for all things digital, significantly 92% of millennials tune-in to Fayetteville radio each week. This is substantially more than watch local TV or visit streaming audio sites such as Pandora or Spotify. To be clear, millennials aren't just casual radio listeners. They spend almost 2 hours per day, every day, glued to their favorite Fayetteville radio stations. Most importantly for Fayetteville small business owners, millennials respond to radio advertising. Recently, IPSOS, a global research company examined how radio advertising affected Amazon's sales during the 36 hours of Amazon Prime Day. Where radio really delivered for Amazon was among millennials. Thirty-eight percent of this audience that was aware of Prime Day ads on the radio made a purchase during the event. Radio's ability to deliver customers was 18.7% better than online ads and a whopping 22.5% better than TV ads. #3. A Radio Commercial Needs To Be Heard Three Times To Be Effective. This myth has its roots in 1890 when Herman Ebbinghaus, a German psychologist, conducted a series of memory experiments. Dr, Ebbinghaus studied how many rehearsals were necessary for his test subjects to memorize a list of nonsense syllables. Three seemed to be the magic number. Flash forward to the mid-1960s. Dr. Herman Krugaman, a public opinion researcher at General Electric was asked to develop a model for effective advertising frequency. Based on the works of Dr. Ebbinghaus, Dr. Krugaman determined that for a commercial to be effective, it must attain three and only three, levels of psychological exposure among the target audience. Quickly, however, Krugman's model was misinterpreted by media buyers to suggest three media exposures were necessary to produce advertising results. Krugman himself was dismissive of the "three exposure rule" propagated by the media buying community. He said, "There is a myth in the advertising world that viewers will forget your message if you don't repeat your advertising often enough. It is this myth that supports many large advertising expenditures...I would rather say the public comes closer to forgetting nothing they have seen [or heard]. They just put it out of their minds until and unless it has some use . . . and [then] the response to the commercial continues." A study conducted by Nielsen, confirms Mr. Ephron's advice. The study indicated that, in fact, a single exposure to a radio commercial could generate an increase in sales. The study goes on to demonstrate, however, that higher levels of frequency will create an exponentially greater lift to sales. The greatest lift came when consumers were exposed 7-plus times to an advertiser's message. Bottom line: there is no science to support the three-frequency rule. The evidence indicates the more frequency...the better. 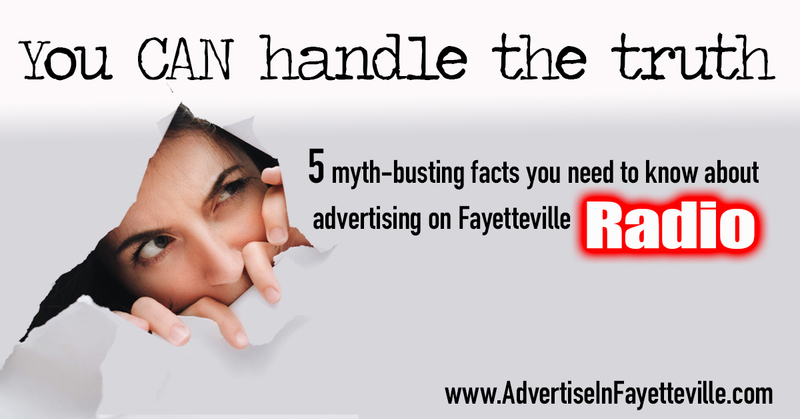 Allison Rogers, Marketing Manager of Fayetteville Regional Airport concurs. She believes continued exposure to the airport's advertising among local travelers has contributed significantly to its growth. 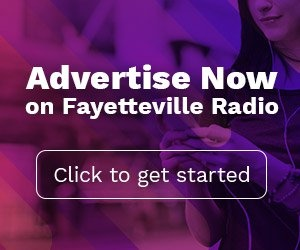 “Of all the media we use, advertising on Fayetteville radio provides us with the affordable reach and frequency we need for our marketing to be effective,” says Ms. Rogers. #4. Internet Advertising Provides Greater Return on Investment Than Radio. 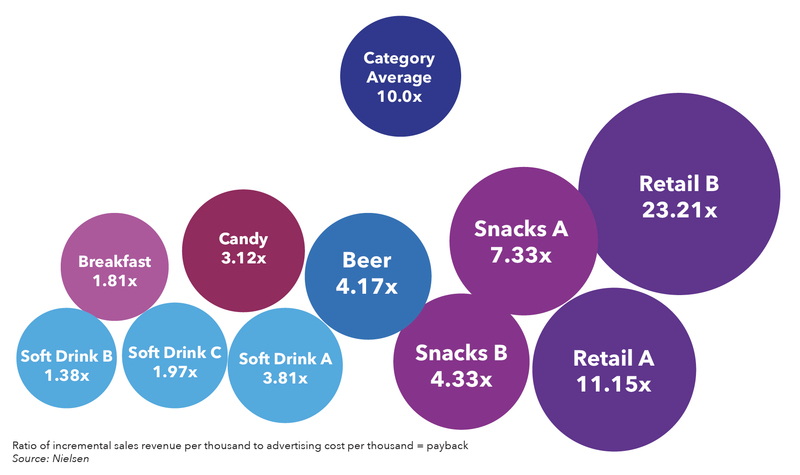 Nielsen has conducted more than 20 studies on what type of ROI a business can expect from its radio advertising. AdAge magazine describes the results of this research as "eye-popping". The most recent Nielsen study revealed that a radio advertising campaign conducted by an auto-aftermarket retailer generated $21.00 of incremental sales for every $1.00 invested. On average, the results of all these studies indicate a 10-time return on investment. According to Ad Age, these findings indicate that advertisers can expect higher returns on investment from radio than TV, digital, or social media. Aime Crouter, co-owner of Cape Fear Flooring agrees. She has been advertising on Fayetteville radio since her store opened in 2000. #5. People Only Listen To Radio During Drive Times. Radio stations broadcast 24 hours a day for a reason: people listen all day, every day. 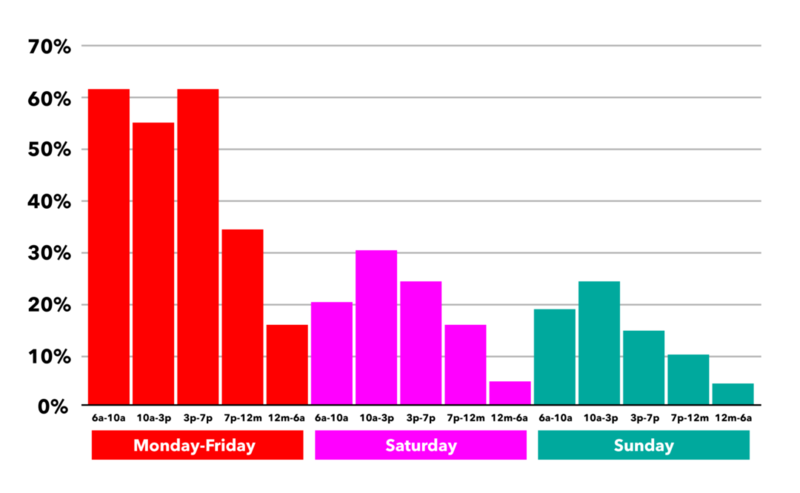 The chart below from Nielsen indicates that although listening to Fayetteville radio peaks Monday-Friday between 6:00am and 7:00pm, there is a significant audience after dark, overnights, and on weekends. During certain times of day, the demand to purchase commercials is greater than the supply. This, then, drives up the cost of advertising during those times. 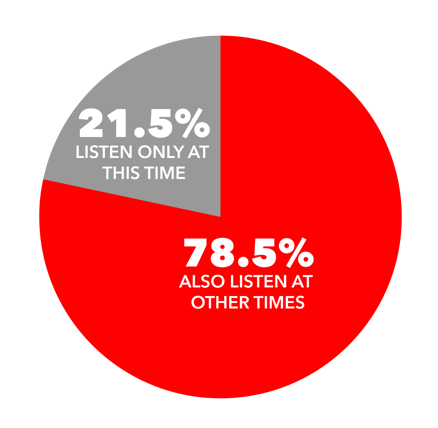 The commercial time in most demand is during the peak listening times. Because of this, some Fayetteville small business owners believed they can't afford radio. For businesses with limited advertising budgets, using fewer ads during prime time and placing more commercials during the lower demand times of the week can prove to be both effective and more cost-efficient. This is because almost 8 out of 10 consumers who tune-in to radio during prime time also listen during non-peak times.